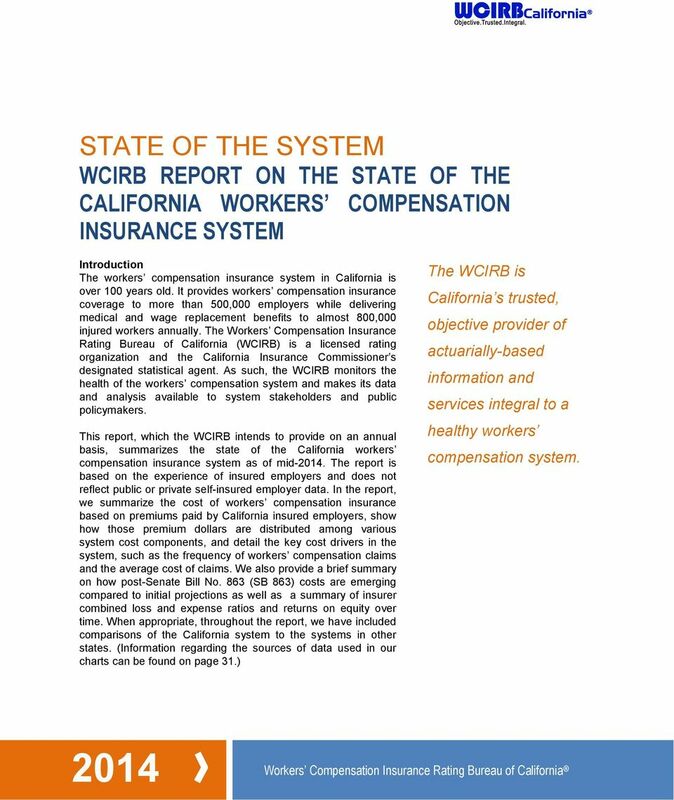 Download "WCIRB REPORT ON THE STATE OF THE CALIFORNIA WORKERS COMPENSATION INSURANCE SYSTEM"
4 4 ABOUT THE WCIRB The WCIRB is a private, nonprofit association of insurer members comprised of all insurers licensed to write workers compensation insurance in California. 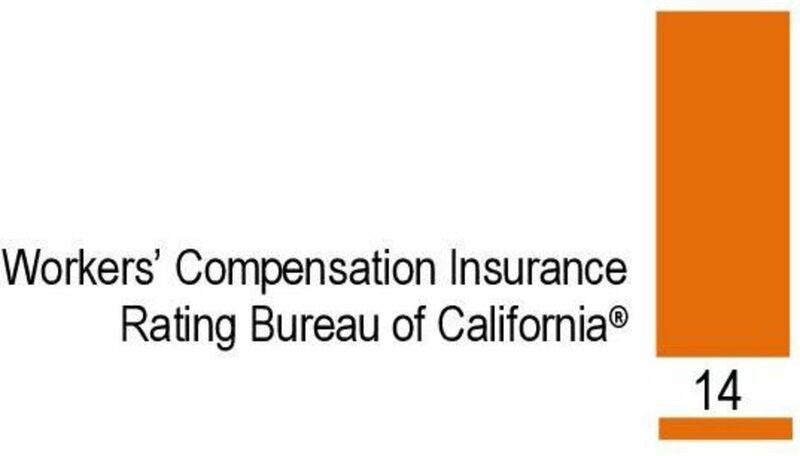 The primary source of funding for WCIRB operations is assessments on member insurers that are proportionate to their amount of written premium in California. No tax dollars or public funds are used to finance the WCIRB s operations. 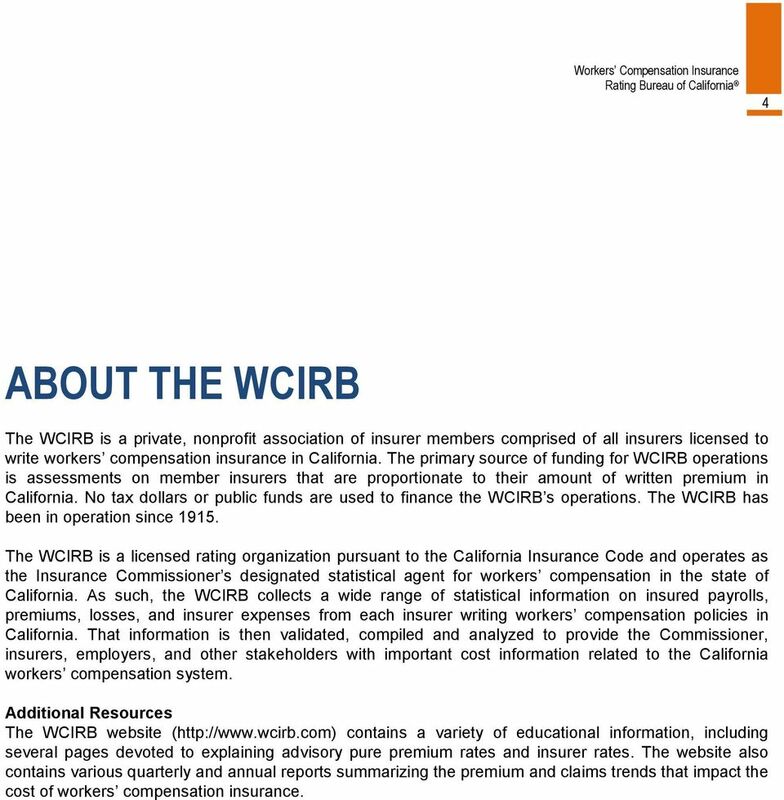 The WCIRB has been in operation since The WCIRB is a licensed rating organization pursuant to the California Insurance Code and operates as the Insurance Commissioner s designated statistical agent for workers compensation in the state of California. 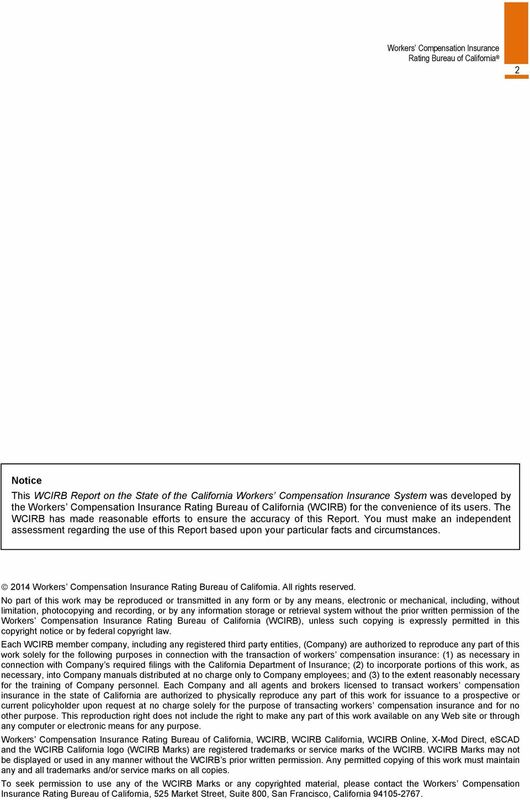 As such, the WCIRB collects a wide range of statistical information on insured payrolls, premiums, losses, and insurer expenses from each insurer writing workers compensation policies in California. That information is then validated, compiled and analyzed to provide the Commissioner, insurers, employers, and other stakeholders with important cost information related to the California workers compensation system. Additional Resources The WCIRB website ( contains a variety of educational information, including several pages devoted to explaining advisory pure premium rates and insurer rates. The website also contains various quarterly and annual reports summarizing the premium and claims trends that impact the cost of workers compensation insurance. 8 8 Chart 5 compares the national median average charged rate to the comparable average rate for California. 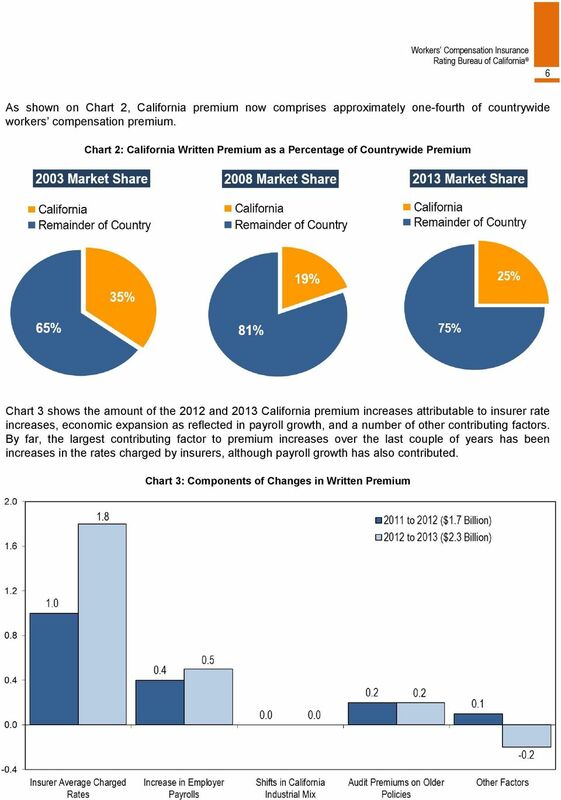 1 Typically, rates charged in California have been markedly higher than rates charged in other states. 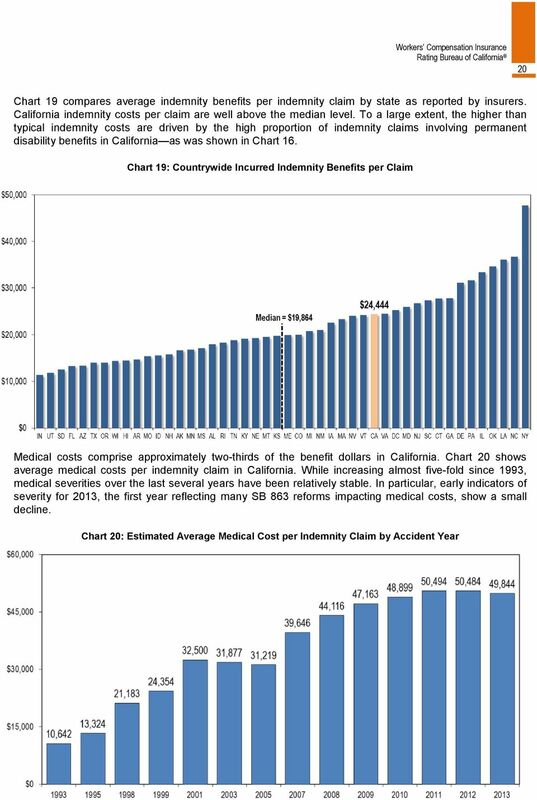 In particular, California s high rates are largely driven by a higher frequency of permanent disability claims, high medical costs per indemnity claim, and higher-than-typical costs of administering claims. 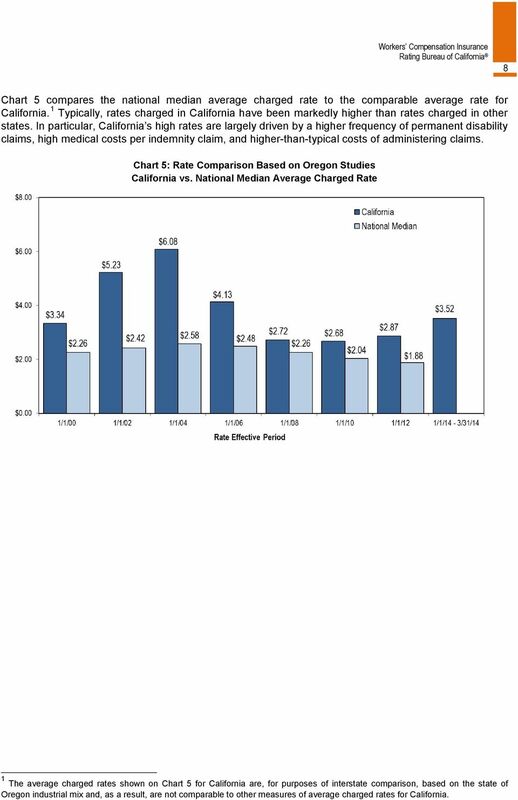 Chart 5: Rate Comparison Based on Oregon Studies California vs. National Median Average Charged Rate 1 The average charged rates shown on Chart 5 for California are, for purposes of interstate comparison, based on the state of Oregon industrial mix and, as a result, are not comparable to other measures of average charged rates for California. 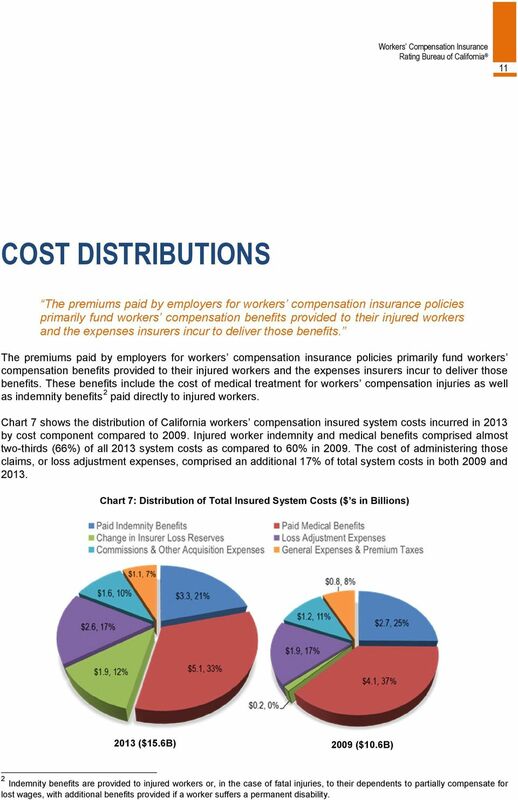 11 11 COST DISTRIBUTIONS The premiums paid by employers for workers compensation insurance policies primarily fund workers compensation benefits provided to their injured workers and the expenses insurers incur to deliver those benefits. The premiums paid by employers for workers compensation insurance policies primarily fund workers compensation benefits provided to their injured workers and the expenses insurers incur to deliver those benefits. These benefits include the cost of medical treatment for workers compensation injuries as well as indemnity benefits 2 paid directly to injured workers. 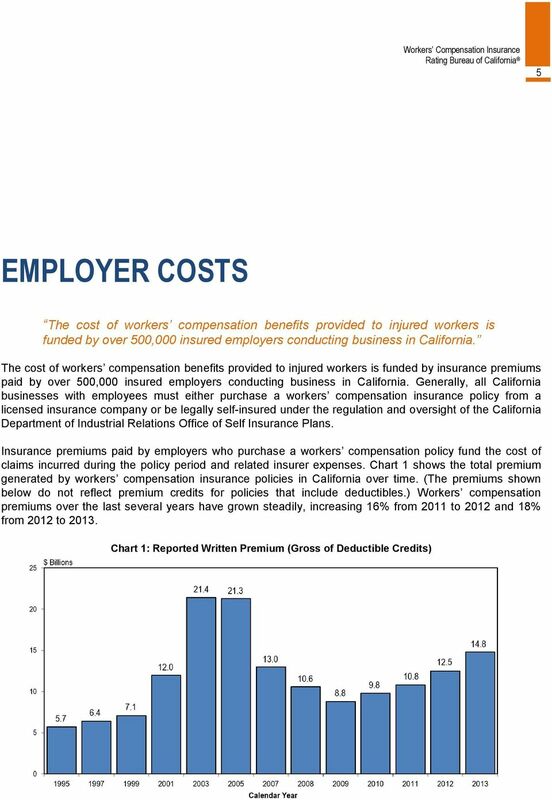 Chart 7 shows the distribution of California workers compensation insured system costs incurred in 2013 by cost component compared to Injured worker indemnity and medical benefits comprised almost two-thirds (66%) of all 2013 system costs as compared to 60% in The cost of administering those claims, or loss adjustment expenses, comprised an additional 17% of total system costs in both 2009 and Chart 7: Distribution of Total Insured System Costs ($ s in Billions) 2013 ($15.6B) 2009 ($10.6B) 2 Indemnity benefits are provided to injured workers or, in the case of fatal injuries, to their dependents to partially compensate for lost wages, with additional benefits provided if a worker suffers a permanent disability. 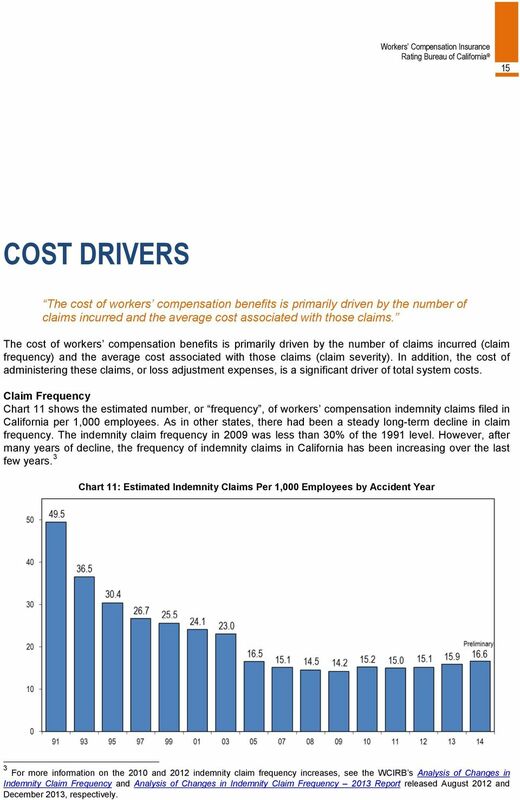 15 15 COST DRIVERS The cost of workers compensation benefits is primarily driven by the number of claims incurred and the average cost associated with those claims. The cost of workers compensation benefits is primarily driven by the number of claims incurred (claim frequency) and the average cost associated with those claims (claim severity). In addition, the cost of administering these claims, or loss adjustment expenses, is a significant driver of total system costs. 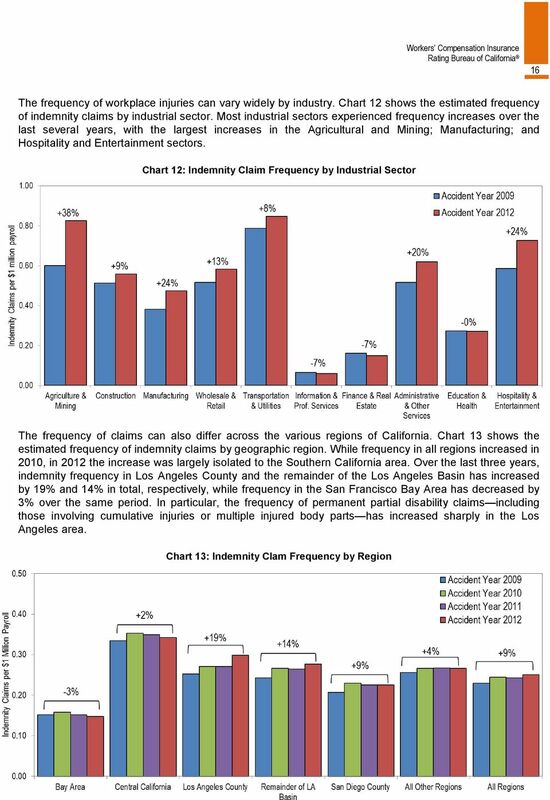 Claim Frequency Chart 11 shows the estimated number, or frequency, of workers compensation indemnity claims filed in California per 1,000 employees. As in other states, there had been a steady long-term decline in claim frequency. The indemnity claim frequency in 2009 was less than 30% of the 1991 level. 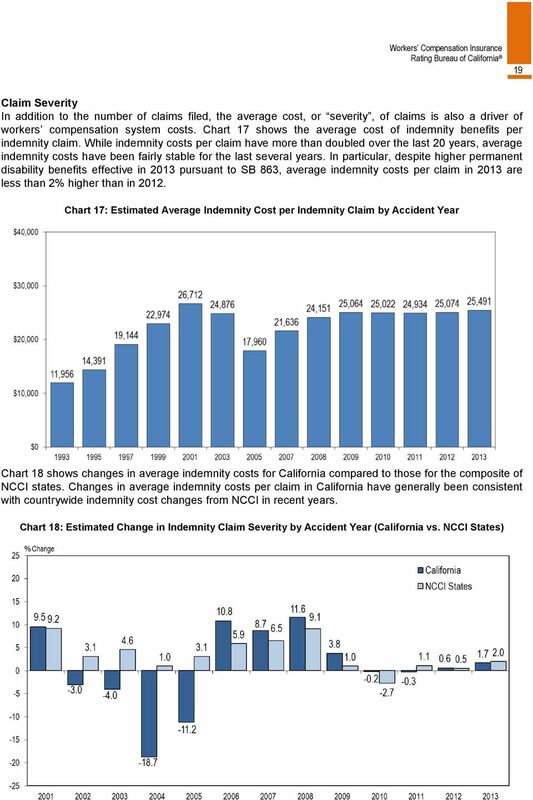 However, after many years of decline, the frequency of indemnity claims in California has been increasing over the last few years. 3 Chart 11: Estimated Indemnity Claims Per 1,000 Employees by Accident Year 3 For more information on the 2010 and 2012 indemnity claim frequency increases, see the WCIRB s Analysis of Changes in Indemnity Claim Frequency and Analysis of Changes in Indemnity Claim Frequency 2013 Report released August 2012 and December 2013, respectively. 22 22 Chart 22 compares the average medical benefits per indemnity claim by state as reported by insurers. California reported medical costs per claim are among the highest in the country with an average cost more than 70% above the median level. 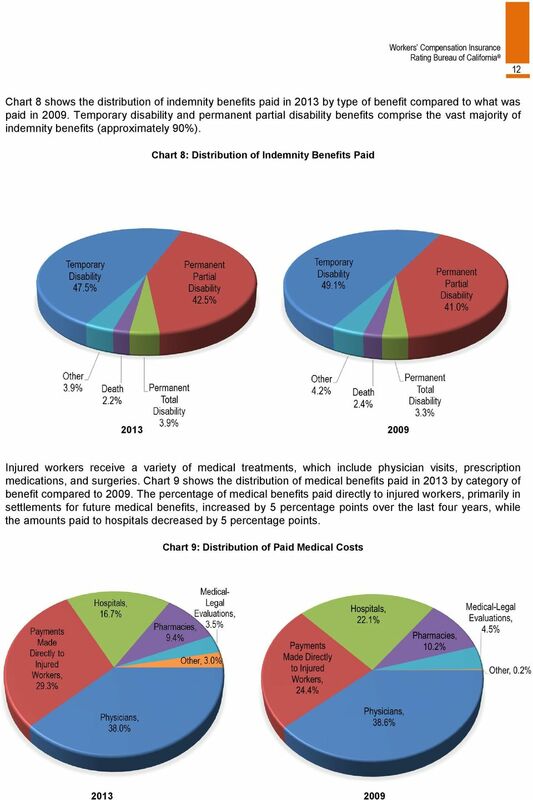 Among the factors leading to this higher-than-typical level of medical costs are the high proportion of indemnity claims involving permanent disability, the longer duration of medical treatment in California, and a higher level of medical-legal costs. 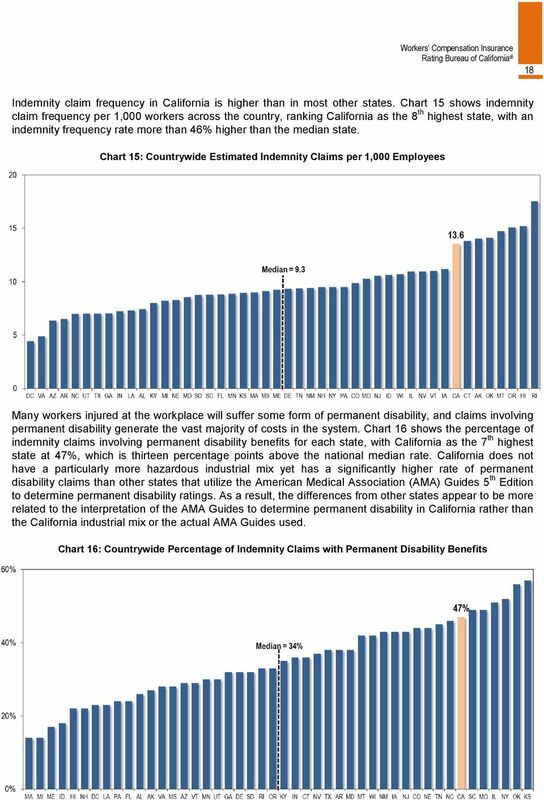 4 Chart 22: Countrywide Incurred Medical Benefits per Indemnity Claim 4 The California Workers Compensation System: A WCIRB Perspective, WCIRB Annual Workers Compensation Conference, June 12, 2014. 23 23 Loss Adjustment Expenses In addition to indemnity and medical benefits, insurers incur expenses related to the handling and administration of workers compensation claims. These expenses, known as loss adjustment expenses", include the cost of insurer claims staff to administer the claims, the cost of attorney and other legal expenses in defending claims, the cost of medical cost containment programs, and other court and claims-related expenses. Chart 23 shows the average cost of loss adjustment expenses that can be allocated to a particular claim for California private insurers. Allocated loss adjustment expenses per indemnity claim have increased steadily since Instead of declining in 2013 following the enactment of SB 863, allocated loss adjustment expenses per claim increased by 7%. 5 Chart 23: Estimated Average Allocated Loss Adjustment Expense Cost per Indemnity Claim by Accident Year 5 The WCIRB initially projected an approximate 13% decrease in loss adjustment expenses following the implementation of SB 863. See Updated WCIRB Evaluation of the Cost Impact of Senate Bill No. 863, WCIRB, October 12, 2012 for more information. 25 25 SENATE BILL NO. 863 (2012) SB 863 included significant increases in permanent disability benefits effective January 1, 2013 and 2014 and a series of comprehensive reforms to the California workers compensation system In September 2012, the Governor signed SB 863 into law. SB 863 included significant increases in permanent disability benefits effective January 1, 2013 and 2014 and a series of comprehensive reforms to the California workers compensation system. The WCIRB initially estimated that the combined cost impact of the SB 863 structural changes that can be evaluated including the Resource-Based Relative Value Scale schedule promulgated late in 2013 approximately offset the cost of the SB 863 permanent disability benefit increases. 6 The WCIRB provided to the California Department of Insurance a multi-year plan to monitor the emerging costs of SB The first report on emerging SB 863 costs was released in October of See Updated WCIRB Evaluation of the Cost Impact of Senate Bill No. 863, WCIRB, October 12, 2012 and the WCIRB s Amended January 1, 2014 Pure Premium Rate Filing submitted on October 23, Senate Bill No. 863 WCIRB Cost Monitoring Plan, WCIRB, March 27, Senate Bill No. 863 WCIRB Cost Monitoring Report Initial Retrospective Evaluation, WCIRB, October 28, 2013. 26 26 Chart 25 summarizes the WCIRB s prospective cost estimate of the key components of SB 863 and the preliminary results emerging based on the WCIRB s initial retrospective evaluation. While it is still premature to retrospectively assess a number of SB 863 reform components, in general, lien savings are emerging at a greater than projected level and, as discussed previously, 2013 indemnity and medical severities are emerging at levels generally consistent with 2012 levels. However, indemnity claim frequency is emerging at a higher rate than projected following the SB 863 permanent disability benefit increases. Also, in part due to the high volume of IMRs, loss adjustment expenses have increased rather than declined in The WCIRB will continue to evaluate post-sb 863 costs as they emerge. Chart 25: WCIRB Cost Evaluation of SB 863 Summary of Estimates ($ s in Billions) Indicates that the cost savings are emerging at levels less than projected or cost increases are emerging at levels greater than projected) Indicates cost savings are emerging generally consistently with projections Indicates that cost savings are emerging at levels greater than projected TBD Indicates that the reform component cannot yet be re-evaluated based on post SB 863 data. 31 31 CHART NOTES Chart 1 Source of the data is WCIRB aggregate financial data calls. Premiums shown are gross of any deductible credits. 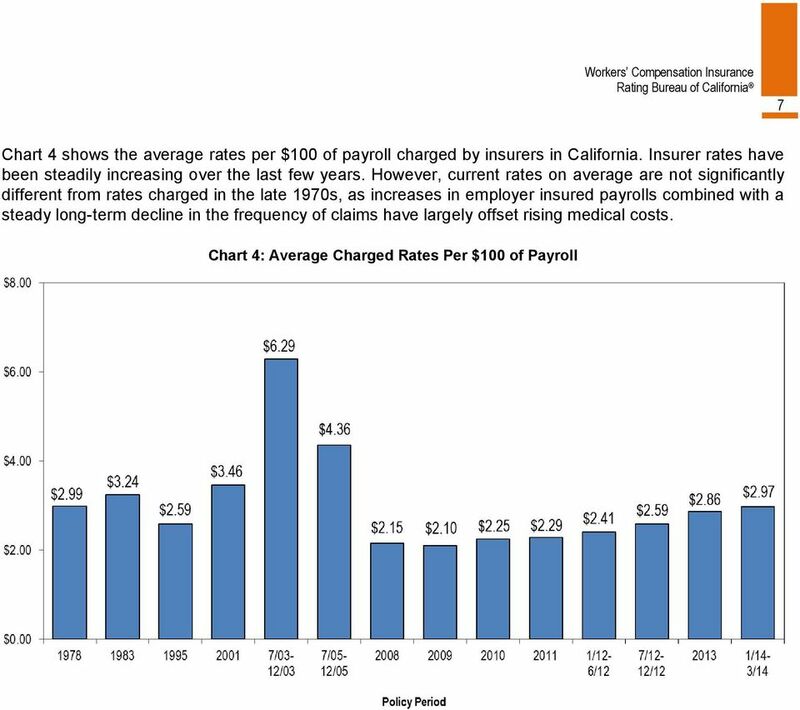 Chart 2 Data sources include WCIRB aggregate financial data calls and National Council on Compensation Insurance (NCCI) May 8, 2014 State of the Line Presentation estimate is preliminary. Premiums are net of deductible credits. Chart 3 Source of the data is WCIRB aggregate financial data calls. Premiums shown are gross of any deductible credits. Chart 4 Data sources include WCIRB aggregate financial data calls and unit statistical data. Chart 5 The information in this chart is based on the state of Oregon biennial rate comparison and is based on the state of Oregon classification mix and, as a result, the California average rates shown on this exhibit differ from other measures of the average California rate. Chart 6 The average rates shown are based on advisory pure premium rates effective January 1, Pure premium rates only reflect the estimated cost of losses and loss adjustment expenses and do not include other insurer expenses, taxes, or profit loadings. The source is WCIRB unit statistical data. The average rates shown are based on policy year 2011 payroll distribution Chart 7 The source of the data is WCIRB aggregate financial data calls. Chart 8 The source of the data is WCIRB aggregate financial data calls. Chart 9 The source of the data is WCIRB aggregate financial data calls. 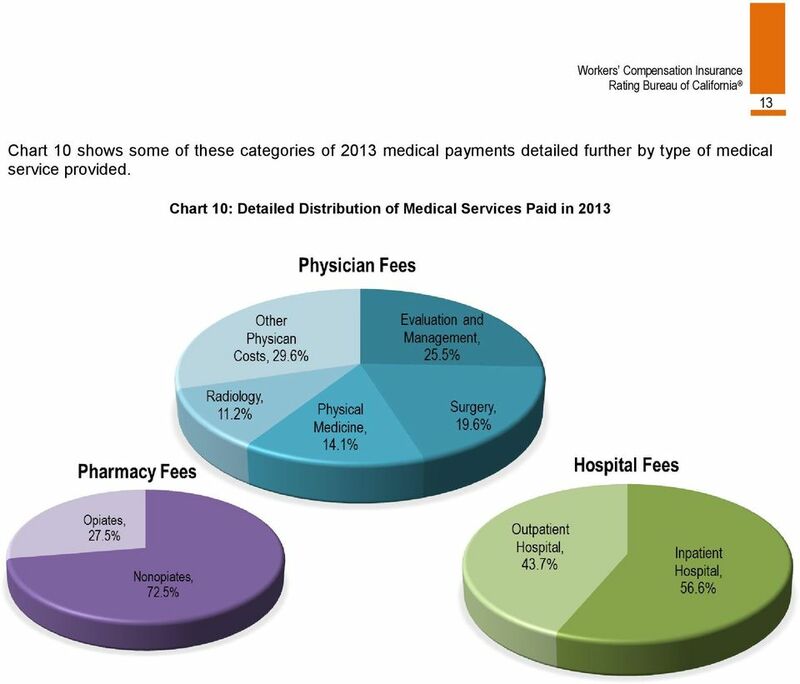 Chart 10 The source of the data is WCIRB medical transaction data. Chart 11 The information in this graph through accident year 2012 is based on WCIRB unit statistical data developed to the 5 th report level. 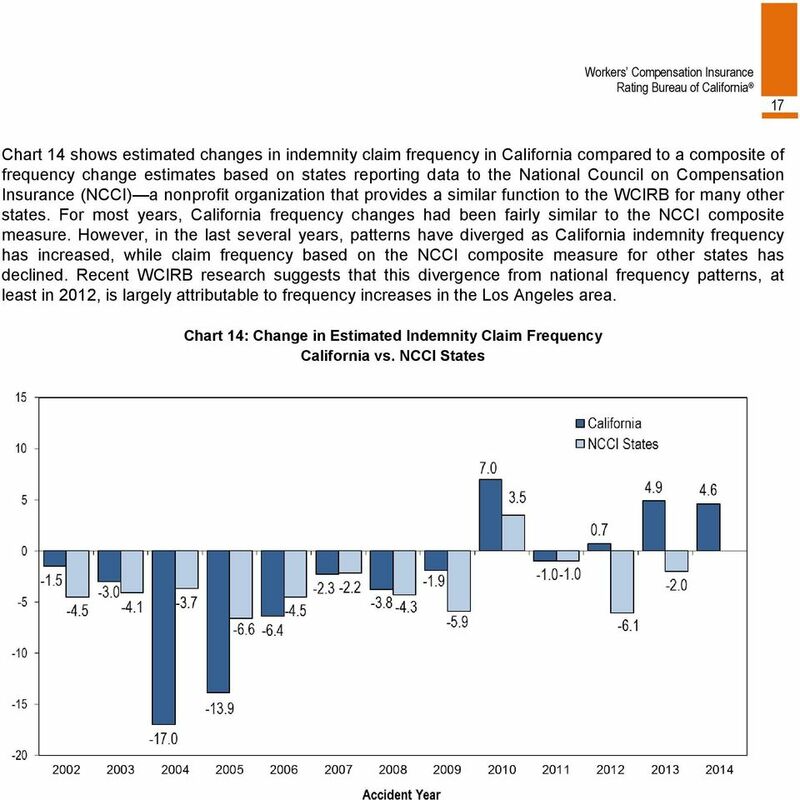 Accident years 2013 and 2014 are based on changes in reported indemnity claim counts from WCIRB aggregate financial data calls as of March 31, 2014 compared to estimated changes in statewide employment. The 2014 estimate is preliminary. Chart 12 The source of the data is WCIRB unit statistical data at the first report level. The frequency is per $1 million insured payroll at a 2010 wage level. 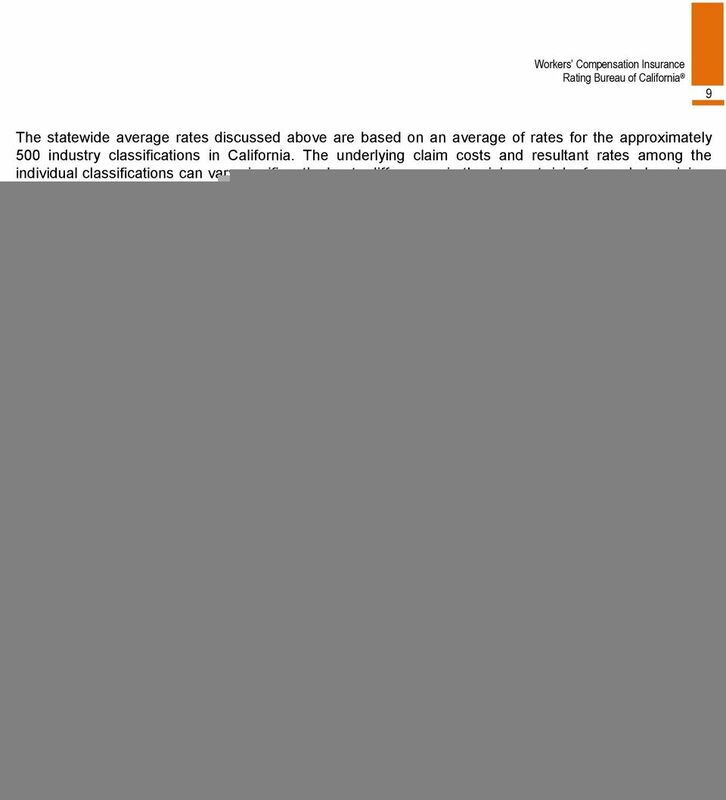 Chart 13 The source is WCIRB unit statistical data at the first report level. The frequency is per $1 million insured payroll at a 2010 wage level. Region information is based on the employer zip code reported on the California policy. Chart 14 NCCI estimates are based on the May 8, 2014 State of the Line Presentation (NCCI 2013 estimate is preliminary and the 2010 and 2011 estimates have been adjusted to remove the impact of audit premium and other factors). Chart 15 The source of the data is the NCCI Annual Statistical Bulletin for 2009 policy year at the first report level. Chart 16 The source of the data is the NCCI Annual Statistical Bulletin for 2009 policy year at the first report level. 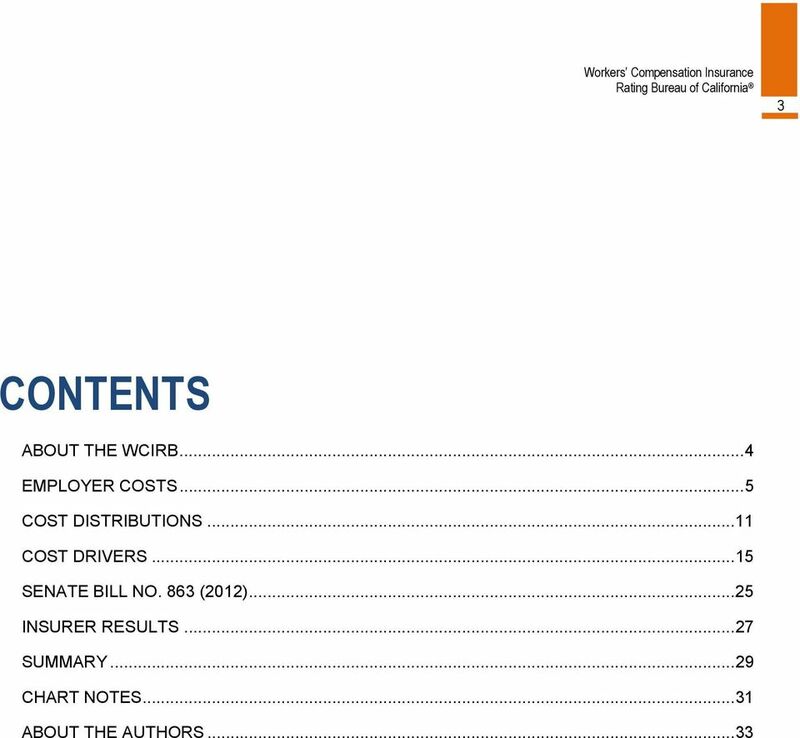 Consulting Actuaries Examining Costs and Trends of Workers Compensation Claims in Connecticut Authors Scott J. Lefkowitz, FCAS, MAAA, FCA Eric. J. Hornick, FCAS, MAAA, FCA Contents 1. Introduction 1 2. STATE OF CALIFORNIA DEPARTMENT OF INDUSTRIAL RELATIONS Christine Baker, Director Office of the Director 1515 Clay Street, 17 th Floor Oakland, CA 94612 Tel: (510) 622-3959 Fax: (510) 622-3265 EDMUND G.
Consulting Actuaries EXAMINING COSTS AND TRENDS OF WORKERS COMPENSATION CLAIMS IN MASSACHUSETTS AUTHORS Scott J. Lefkowitz, FCAS, MAAA, FCA Steven G. McKinnon, FCAS, MAAA CONTENTS 1. INTRODUCTION 1 2. RESEARCH UPDATE. Temporary Disability Outcomes in California Workers Compensation. Accident Years 2002 2009. Background. c a l i f o r n i a California Workers Compensation Experience Rating Plan 1995 Title 10, California Code of Regulations, Section 2353. Consulting Actuaries Examining Costs and Trends of Workers Compensation Claims in New York State Authors Scott J. Lefkowitz, FCAS, MAAA, FCA Steven G. McKinnon, FCAS, MAAA Contents 1. Introduction 1 2. State of the Workers Compensation Market Natasha Moore, FCAS, MAAA Practice Leader and Senior Actuary August 25, 2015 WCEC Orlando, Florida Copyright 2015 National Council on Compensation Insurance, Inc.
NCCI s. and Management. Copyright 2009 National Council on Compensation Insurance, Inc. All Rights Reserved.